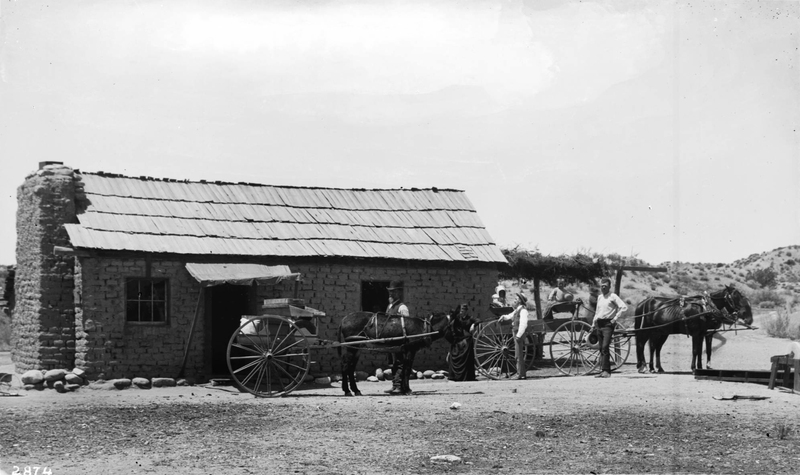 This adobe home, seen here about 1885, was built some 20 years prior by Santitago Garcia, whose wife is the earliest identifiable common ancestor of modern families with Tataviam Indian heritage. Santiago is the progenitor of the "Garcia" surname among local Tataviam families. According to ethnographer David Earle, the adobe stood east of Acton and south of the town of Littlerock, "on a bench on the north side of Little Rock Creek approximately one-half mile (0.8km) to the east of where the creek turned from north to east near Totem Pole Ranch. At this wet spot, where the San Andreas fault system forced water to the surface, the Garcia cienaga [swamp] was located." 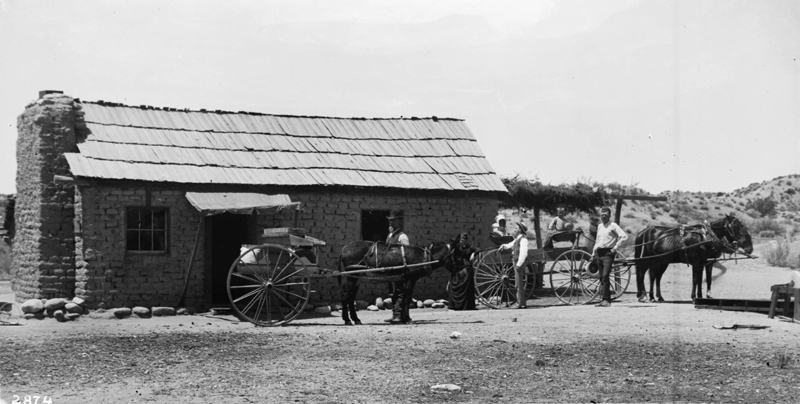 The 1870 U.S. Decennial Census places Santiago at this location and lists his occupation as a farmer with a net worth of $450. Earle surmises that he was irrigating crops, inasmuch as he "had apparently constructed a head gate on Little Rock Creek adjacent to his property." Santiago Garcia was born about 1833 to a native California Indian mother, as shown by DNA testing. His father may have been from Sinaloa, Mexico. According to descendants, his wife, Catalina Leyva (or Leiva), was a California Native of the Serrano tribes of the Shoshone wedge (Tataviam, Kitanemuk, Vanyume). Earle lists their children, in descending order, as Sanon, Eufracia, Isidoro, Octavia and Elasio. Isodoro became the patriarch of the Garcia family in 1873 when Santiago was killed by a grizzly bear in the canyon named for him (Santiago Canyon, where Acton is). Following Santiago's death, his widow and her children left the adobe on Little Rock Creek and moved near the San Fernando Mission. The adobe may have served as a stage station on the "Old Fort Tejon Road;" it is believed to have stood until the 1930s. Isodoro married Josefina (Josephine) Leyva (Leiva), daughter of Leandra Culeta, whose father's family was from the Chaguayabit (Tsawayung) village at the confluence of Castaic Creek and the Santa Clara River (i.e., Castaic Junction). Leandra's mother was Eugenia Mendez, who lived at Quissaubit, a Serrano/Kitanemuk village south of present-day Quail Lake. Eugenia's mother descends from the Serrano/Vanyume village of Topipabit in the Victorville area. From Isodoro, the family leadership passed to Isodoro and Josefina's daughter, Frances Garcia (b. 1884), who married Fred Cook (1881-1958), also of local Native American ancestry. Frances died in a 1946 car crash and the title descended to Dolores and Fred's daughter, Mary Cooke Garcia. In the late 1950s one of Mary's nephews, Charlie Cooke (grandson to Frances), who grew up in Newhall, began to immerse himself in local Indian affairs. In 1959 Mary and her family members agreed to name Charlie their leader (see Gordon 2013:54). Charlie Cooke was the family patriarch for 50 years, actively safeguarding traditions and championing Native American causes particularly in northern Los Angeles County and Ventura County. In retirement he lived (where else?) on Santiago Road in Acton. In a 2009 ceremony, the leadership and traditions that had been passed down through four generations from Santiago Garcia flowed to a fifth generation when Charlie, then in his early 70s, handed his chief's staff to Mary's grandson, Ted Garcia Jr.
SOUTH is at the TOP in this 2017 Google Earth view. 34729 Cheseboro Road is the Totem Pole Ranch. The green area at left might be the general location of the adobe. Click to enlarge. 1. Earle, David D. "Mining and Ranching in Soledad Canyon and Antelope Valley," Jan. 8, 2003. 2. Chief Ted Garcia, with Karen Varela (2014). 4. Johnson, John R., and David D. Earle. "Tataviam Geography and Ethnohistory," 1990. 5. Garcia & Varela, ibid. LW2628: 19200 dpi jpeg from jpg | Online image only.